Develop a school Code of Conduct together with the parents and community. Post signs to alert visitors to the building and to remind students and staff. posting links to more information on the school website. 4. Provide a list of alternative product names and refer staff and students to the website www.lesstoxicguide.ca to help them get started. first time: explain the rationale for a scent-free school and give them the opportunity to shower and change clothes in the school, or the option to do so at home before returning to school. second time: one day unofficial suspension, or the option to go home, shower and change before returning to school. third time: two days unofficial suspension with, again, the option to go home, shower and change before returning to school. In each instance, call the parents and tell them why their child can’t be in school. Ask for their support. Do an education piece with that student and the parents if needed. In cases where a student or staff member has a severe health impact such as anaphylaxis, advise him/her to avoid the scented area, and then identify the wearer and proceed with intervention. To bolster the Scent-Free program (some schools call it a “Scent-Smart” program) outline the connection between fragrance chemicals and health and point out that hospitals and other public buildings have scent-free environments for health reasons. Also, point out that chemical-induced symptoms such as brain fog and headaches interfere with a student’s learning ability. Be aware of cultural misunderstandings such as believing that, so long as a scent is pleasant, it is acceptable. This is not bad news. This is what you need to know. This is what we expect in this school. There is no smoking in this school and, for similar reasons, it is also a scent-free environment. Fragrances in products are created from man-made chemicals. The chemicals make our sensors believe we smell a fruit or “fresh outdoors”, or whatever. But we are not. We are smelling chemicals. The chemicals affect everyone in some way but, for some, it is life-threatening. It is a health issue. Not a “like” or “dislike” issue. However, likes can matter too. Just because you think a fragrance is pleasant doesn’t mean others will agree. So, for this reason as well, we don’t inflict our tastes on others. We take care in bathrooms to control smells. In schools we take care to wear clothing that is non-offensive. We also remove body odour after gym class by showering. In the same way, we need to take care to not pollute our shared air, especially if it causes harm. Do not assume that everyone will appreciate the product you use in the shower after gym class. “This smells nice”, you say. Not to me. Not to the teacher who passes out from the chemicals or the student who gets asthma attacks or headaches from sitting next to you. Aftershave is a chemical you put on your skin. The skin is not a barrier. Chemicals go into the body, accumulate in body tissue, and can do harm. Other places may have no problem with scented products but it is not what we do here in this school. Students don’t have the option to get up and leave if they are bothered by someone’s perfumed product. 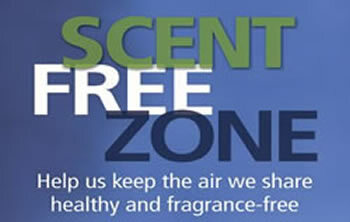 Scent-free programs are to prevent harm from inhaled fragrance chemicals. Although they are working to improve things, Health Canada does not control fragrance chemicals, even though some are known to be toxins, such as toluene and benzene. There are non-toxic, chemical-free alternatives for aftershave, deodorants and most personal products. See www.lesstoxicguide.ca. www.lesstoxicguide.ca has facts, how to read product labels, and gives some alternative product names. CASLE would like to thank the school administrators who provided the information for this article. Many new families have moved into our school community and may not be familiar with our Scent Smart program. Our school has students and staff who experience symptoms such as headaches, asthma, and much worse, when they breathe even small amounts of fragrance chemicals. Some are unable to think clearly – something that is important to be able to do well in a school setting. According to the U.S. Food and Drug Administration fragrances cause 30% of all allergic reactions, and 70% of all asthmatics develop respiratory symptoms when exposed to perfumes. Many schools, hospitals, and businesses are eliminating scented products and toxic chemical cleaning agents because they recognize that every day chemicals pollute indoor air – and that health problems can be caused by low exposures that were once believed to be harmless. Chemically scented products include: perfumes, deodorant, hair spray, hair gels, skin creams, smelly markers, smelly stickers, and many more. What we use at home can make a difference to our Scent-Smart program. Chemical odours from room deodorants, soaps, detergents, fabric softeners, and other products can linger on clothes and be carried into the school. They can cause the same health problems as can the scented personal products. – Most fragrances are no longer made from plant/animal products. They are about 97% synthetic chemical, with as many as 400 chemicals in a single fragrance. These combine to make our neurosensors think we are smelling a particular scent. The combinations of thousands of available chemicals used in the fragrance industry can create everything from the strawberry scent of smelly markers to the lemon or pine smell of some cleaning agents – from scented garbage bags to copies of expensive French perfumes. – Fragrance chemicals are not regulated by government. Some chemicals known to cause cancer, birth defects, and nervous system problems are still in use even after the U.S.FDA and Health Canada requested (not legislated) that the fragrance industry stop using them. For example, the US Environmental Protection Agency found 100% of perfumes contain toluene, a known mutagen and sensitizer. – Natural is not always better. Many natural products such as citrus oils, pine terps, orris root (used in many perfumes) and many other natural substances can cause symptoms. It only takes one person entering the building wearing a scented product to affect the air quality. This is because scented products can drift throughout an entire area wherever the air takes them. Extra effort is needed at concert time or on parent/teacher interview days. We recognize that it takes effort to find less toxic alternative products. To help you we have attached a brief list of suggestions. There are many more listed on www.lesstoxicguide.ca. Unscented products are becoming easier to find as industry responds to public need. Here is a list of household and personal products which may help you get started. These and others are available at local grocery stores and drugstores. They are not necessarily Non-Toxic, but are Less-Toxic and unscented. That is, very sensitive individuals may or may not be able to use them. However, they are less-toxic for the user and they can generally be worn without fear of causing discomfort to a nearby sensitive individual. Or try 1/4 c baking soda in the final rinse and 2 or 3 loosely rolled balls of aluminium foil in the clothes dryer. Synthetic fabrics produce more static than natural fabrics like cotton, wool, linen, and silk. Disinfectant hand soaps are not necessary. Disinfectant cleaners are registered with government as pesticides. Pesticides are designed to kill living organisms. The US Centre for Disease Control in Atlanta reports normal scrubbing with hot water and soap to be as effective as disinfectants. Hydrogen peroxide cleaners can work as a disinfectant if one is needed. Room Deodorizers and bathroom deodorizers are particularly potent chemical sources. Many contain Paradithero Benzene, a known neurotoxin. Some mask odours by using other strong chemically produced scents. Others function by chemically suppressing our ability to smell. Air out dry cleaned clothing 24 hours. Students and teachers function better in clean indoor air. Please help us in our efforts to make our school a more healthy, scent-free environment for all, but especially for those already suffering from allergies, asthma, and related illnesses. Many thanks for your support of our Scent-Smart program. The AMICUS Journal, Natural Resources Defence Council, Vol. 11, No.1, 1989. Crook, W.G. & Stevens, L.J. Solving the Puzzle of your Hard to Raise Child. The Healthy School Handbook, U.S. National Education Association. 1995. Jackson, E.M. PhD. Substantiating the Safety of Fragrances and Fragrance Products. Cosmetics and Toiletries, Vol.108,June,1993,p.44. Kjaergaard, S. Human Reactions to a Mixture of Indoor Air Volatile Organic Compounds. Atmospheric Environment, Vol. 25A, No. 8, 1991, p.1417-1426. Lorig, TS EEG and ERP Studies of Low-Level Odor Exposure in Normal Subjects Toxicology and Industrial Health, Vol. 10, No. 4/5, 1994. Morrow, L.A. et.al. Alterations in Cognitive and Psychological Functioning after Organic Solvent Exposure. Journal of Occupational Medicine. Volume 32, No. 5, p. 444-450, May 1990. Rapp, D.J. M.D. Is This Your Child? William Morrow and Company, N.Y. 1991. Rogers, S. M.D. Tired or Toxic, Prestige Publishing, N.Y. 1990,p.12-24. Turiel, I. Indoor Air Quality and Human Health. Stanford University Press, 1985. Wilkenfeld, I.R. Patient Education: Scents Make No Sense. The Environmental Physician. Fall,1991. Wilkenfeld, I.R. Prescription Environments: Solutions to the Sick Building syndrome. 1994. The World Health Organization, Environmental Criteria 59, 1986, Geneva.